When I was working in global Advertising in New York City, I never seemed to have any time for anything other than meeting and putting out fires. When it came to lunch, I seldom had more than 10 minutes to wrap up my meeting with my team in London before getting on a call with my team in Sao Paulo. I would reach for convenient packed foods – usually a Clif bar and a bottle of water. Of course, it only got worse when I traveled internationally. Being between time zones and still have to manage a team globally started playing havoc with my health. For a fleeting moment, I wished that somebody could come up with a convenient packaged food which contained ACTUAL nutrition, instead of mostly sugars and “natural” ingredients. To cut a long story short, when I came up with the idea for the VedaBars, I wanted at least one of the bars to have real vegetables in them. After all, Vegetables not only contained ACTUAL nutritional value, but would taste great in a formula I developed. I also found out that there were no other products on the market place that offered vegetables in their list of ingredients. The VedaBars are unique, but the VataBar is extra special. The VataBar is made out of beets, yams, oats, almonds, ghee and maple syrup and nothing else. 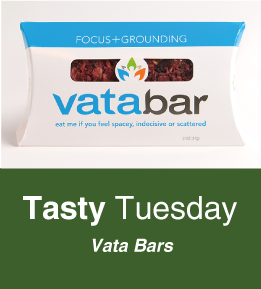 We will be selling the VedaBars at Tone again soon, but I’d like to dedicate this Tasty Tuesday to my idea of VedaBars – the first Ayurvedic Wholefood bar. 2. Add the molasses and egg. Beat well to combine. 3. Add the grated and crystallized gingers. 4. In another bowl, mix together the flour, ground ginger, baking soda and salt. 5. Add the flour mixture to the wet mixture. Stir with a wooden spoon until blended. 6. Cover the dough and refrigerate for at least one hour. 7. Preheat oven to 350 degrees. Lightly grease a cookie sheet. 8. Shape the dough into 1-inch balls by rolling a small amount between your palms. Place them on the cookie sheet about 2 inches apart. Pat the balls down slightly. 9. Bake for about 10 minutes, or until the cookies have flattened out and started to crinkle on the surface (think classic ginger snaps). 10. Enjoy them fresh out of the oven! When I was a kid, ginger always reminded me of my Grandmother’s cooking. It was one of her favorite spices because she used it mostly at Christmas time, which was her favorite time of year. When I would bake with her, she would always let me open the packet of powdered ginger and would always have a handkerchief at the ready because I would invariably open the packet too quickly and cause myself to sneeze! In Ayurveda, ginger is used almost ubiquitously as a digestive stimulant, pain killer, anti-inflammatory and anti-nausea. It’s also been used to reduce headaches. I use fresh ginger root every morning in hot water which help get my digestion going. 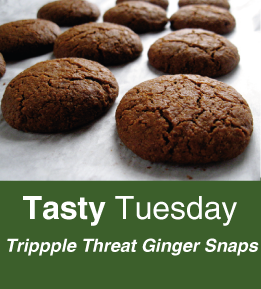 These triple threat ginger snaps contain powdered, fresh and crystallized ginger. They are spicy and not overly sweet. Tuesdays @ 6:10pm – Ayurveda Chat – Ayurveda and Rheumatoid Arthritis Part 2 – How to reverse the effects of RA through purification and diet. Beat egg whites until they peak. Fold sugar gently into egg whites. Fold in dates, papaya, vanilla, cashews and coconut. Spoon onto a non-stick or well oiled cookie sheet and garnish with toasted sesame seeds. This is one of my favorite Ayurvedic recipes . 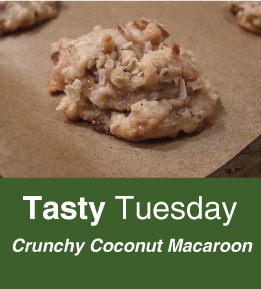 They are gluten free and call for one of my most favorite ingredients – coconut! Coconut is one of the best foods in Ayurveda to pacify the Pitta dosha. People who have a predominantly Pitta dosha tend to run warmer and need to consume more water than those who have a predominance of another dosha. The summer season is also known as Pitta season, so it’s a good idea to be more mindful of the heat. Coconut water contains many natural electrolytes, like potassium, which help with absorption and preventing muscle cramps. Coconut also has a natural cooling action, which is great to prevent any Pitta imbalances. Coconut can also help to remove toxins, help balance stress hormones and can bring luster to the skin. Sesame seeds are great for balancing the menstrual cycle and are an iron-rich food. Papaya is also an anti-toxin and can help to cleanse the liver and cashews can aid in digestion. Tuesdays @ 6:10pm – Ayurveda Chat – Ayurveda and Rheumatoid Arthritis Part 1 – How the pathology of RA begins in the body. https://www.tonefitness.com/wp-content/uploads/2018/04/tone-logo.png 0 0 alyson https://www.tonefitness.com/wp-content/uploads/2018/04/tone-logo.png alyson2014-05-13 11:25:212014-05-13 11:27:23Crunchy Coconut Macaroons! It’s Tasty Tuesday – Ayurveda Style! Grind the nuts in a food processor until they have a flour-like consistency. Add the cocoa and cinnamon powder to make as chocolaty as you like. Add the dates and the maple syrup. Blend together in the food processor, adding more dates until you get a “breakable” dough, which can hold form. Form into walnut sized balls in your hands. Roll and gently press the balls in the coconut. Store in the fridge for up to 4 days . . . if they last that long! Chocolate Ladoo are my absolute favorite treats when I’m in India (once I’ve gone through the Ayurvedic purgation program which was prescribed to me, of course). Traditional Ladoo are made with condensed milk and a lot of chocolate, so the decadence outweighs the health benefits. 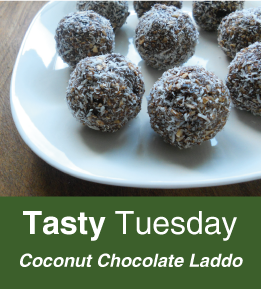 This recipe shows how you can make a much healthier Ladoo. In Ayurveda, the bitterness in the unsweetened chocolate is stimulating and is used for an aphrodisiac. 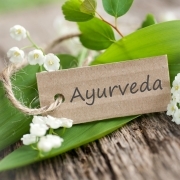 Aphrodisiacs in Ayurveda focus more on strengthening the reproductive tissues. Cinnamon is warming and helps regulate the blood sugar. Dates are considered “sattvic” which means that they can be digested easily. Dates are great before and after exercise, as they are loaded with potassium and other minerals that are consumed during exercise. They are also grown in California, so they are a “local” super food. You’ll also notice that I only cook with Grade B maple syrup, not Grade A. Grade B is less refined, meaning that the syrup retains more minerals like potassium, calcium, zinc and manganese. https://www.tonefitness.com/wp-content/uploads/2018/04/tone-logo.png 0 0 alyson https://www.tonefitness.com/wp-content/uploads/2018/04/tone-logo.png alyson2014-05-06 10:26:282014-05-06 10:27:11It's Tasty Tuesday - Ayurveda Style!